Property owners around the country continue to file lawsuits against DuPont over its tree-killing herbicide, Imprelis. Most recently, a Minnesota property owner represented by Gilman Law LLP, a national law firm assisting individuals with tree damage from Imprelis, filed a class action lawsuit in Minnesota federal court seeking compensation for amounts paid for lawn care services, the loss of trees, and other damages on behalf of Imprelis victims in Minnesota and throughout the U.S.
Imprelis is the brand name for aminocyclopyrachlor, an herbicide conditionally approved by the U.S. Environmental Protection Agency (EPA) in August 2010. DuPont promised that Imprelis would provide professional landscapers with an environmentally safe way to kill unwanted broad leaf weeds, including dandelions, clovers, ground ivy, and wild violets. However, shortly after Imprelis became commercially available in the Spring of 2011, reports started coming in from Minnesota, Indiana, Illinois, Ohio, Michigan, Pennsylvania, Maryland, Virginia, Delaware, Wisconsin, West Virginia and other states that trees located in proximity to Imprelis applications were either dead or dying. Most of the reports involved conifer trees, including Norway Spruce, white pine, white spruce, Colorado blue spruce, and described yellowing, browning, curling, and/or dieback of current-season growth. 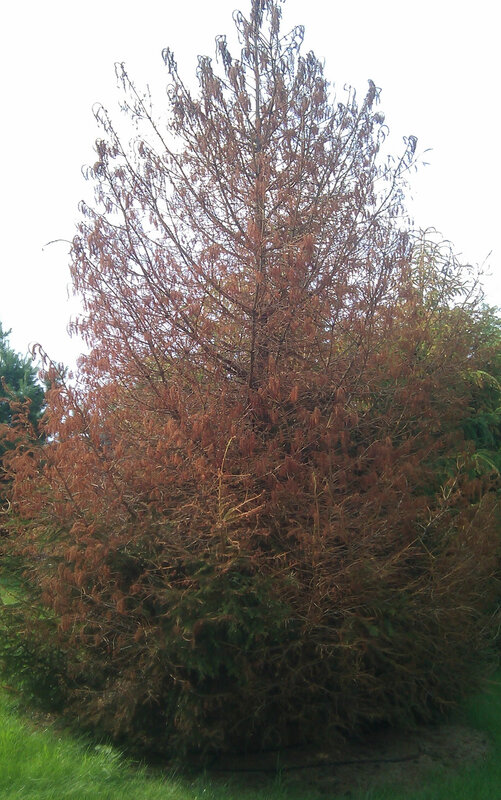 In the most severe cases, entire trees turned brown and began to loose their needles. Both DuPont and the EPA launched investigations that summer, and on August 4, 2011, the EPA issued a Stop Sale & Removal Order to DuPont, effectively banning Imprelis. By the time the order was issued, DuPont had submitted more than 7,000 adverse incident reports to the EPA involving Imprelis. Thousands of property owners who lost valuable, mature landscape trees to Imprelis have since filed suit against DuPont in a consolidated litigation now underway in U.S. District Court, Eastern District of Pennsylvania seeking compensation for their dead and dying trees. DuPont has also set up its own claims process, and set aside $225 million for those claims that have already been submitted. The New York Times recently reported that the payout under that program could ultimately reach $575 million. However, some property owners who filed for compensation through that program told the Times that they had grown frustrated with DuPont. Apparently the process has been rather slow thus far, and DuPont’s communication with claimants has left a lot to be desired. It should also be noted that claimants who do accept compensation through this program must permanently waive their right to sue DuPont. The lead Plaintiff in the class action lawsuit filed by Gilman Law LLP sustained damage to several trees on his property since having Imprelis applied to his lawn last year. The complaint alleges that trees can absorb Imprelis through distant, unexposed roots. As such, exposure and damage cannot be prevented by avoiding direct contact between Imprelis and the trunk and/or leaves. The lawsuit further alleges that DuPont failed to warn users that if Imprelis is applied as directed, non-target vegetation will be killed or damaged by herbicide. As a result, property owners have suffered the loss of thousands, if not tens of thousands, of mature trees. Gilman Law LLP is still offering free legal consultations to Imprelis victims nationwide, including tree farms, residential property owners, tree nurseries and forests, golf courses, composting sites, turf managers and professional landscapers, parks, schools, and college campuses. Anyone considering filing suit against DuPont should contact the firm immediately, before their state’s statute of limitations expires, or they may miss their chance for any recovery. Gilman Law LLP also urges property owners to seek legal advice before accepting any agreement from DuPont to ensure the offer is fair. Free consultations are available by completing our Free Imprelis Consultation Form, or call Toll Free at 1-888-252-0048. This entry was posted in Toxic Substance Lawsuits and tagged dupont, herbicide tree damage, imprelis, imprelis attorney, imprelis claim, imprelis law firm, imprelis lawsuit, imprelis lawyer, imprelis settlement, imprelis tree damage, norway spruce damage, tree damage, white pine damage on August 1, 2012 by Gilman Law.